Team Van Oord partner Van Oord has ordered two new trailing suction hopper dredgers, each with a hopper capacity of 10,500m3. The move is part of Van Oord’s innovative investment programme and – with both vessels to be fitted with an LNG (liquefied natural gas) installation – is further confirmation of Van Oord’s sustainability ambitions. The new hoppers will replace existing vessels as part of Van Oord’s drive to make its fleet more economical and energy efficient. Both qualify as Tier III vessels (IMO emission standards) and will be fitted with dual fuel engines. The design includes several features that will reduce fuel consumption, and consequently carbon emissions, by a considerable margin. They will be equipped with innovative and sustainable systems and will obtain a Green Passport and Clean Ship Notation. In 2015 it was estimated that shipping could be responsible for 17% of global CO2 emissions in 2050 if left unregulated. To combat this, earlier this year a major new international agreement was unveiled to cut carbon emissions from the global shipping industry by at least half by 2050. 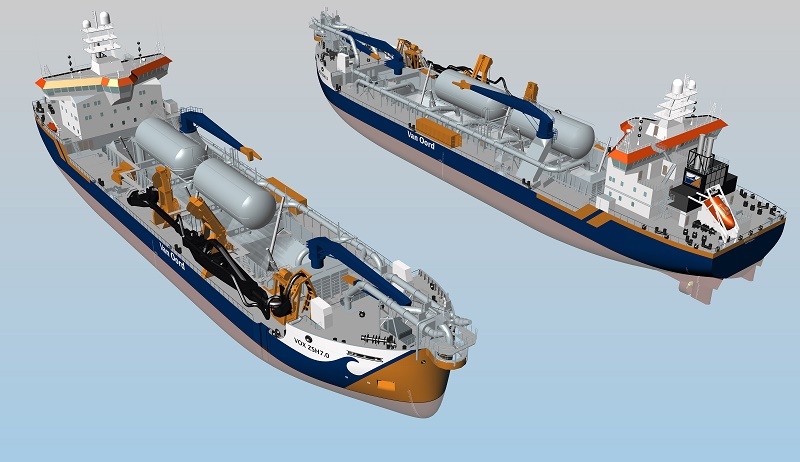 “These state-of-the-art vessels will boost the mid-class section of our fleet of trailing suction hopper dredgers. The new vessels each have a hopper capacity of approximately 10,500m3 and measure 138 metres in length and 28 metres across the beam. The vessels will be equipped with one suction pipe with submerged e-driven dredge pump, two shore discharge dredge pumps, five bottom doors, and a total installed power of 14,500 kW. They will have accommodation for 22 persons. Van Oord’s fleet consists of more than 100 vessels, including more than 20 trailing suction hopper dredgers with a capacity from 1,000m3 up to 38,000m3. Van Oord deploys the trailing suction hopper dredgers for a wide range of global activities including coastal protection, port construction, deepening waterways and land reclamation. Van Oord designed the vessels in-house in cooperation with DEKC Maritime from the Netherlands. They will be built by Keppel Singmarine Pte Ltd at its yard in Singapore, and will be delivered in 2021.